Why We Do What We Do - The Importance Of Leaving A Legacy. Something really beautiful has come out of Michael Jackson's passing. As I walked down the street yesterday, every car that passed had his music booming out of it. There were black people, little chinese old people, teens; everyone was doing the same thing. On the train, heaps of people had headphones in and it was clear we were all doing the same thing. Some of us even did a very subtle acknowledgement of each other. It was like a telepathetic, subtle nod to each other. Maybe that didn't happen, maybe I just felt it. Either way, despite people reading about what drugs may have killed him and being reminded of what he may or may not have done to children -- what stood out most, what we were all reminded of, was the indeliable mark he has left on the universe with his art. When you really think of the power of that, it's enormous. What really hit me - was his message. It was one of peace, one of love. I have always loved 'Man In The Mirror' but always heard it on a simplistic level. The message to me was 'make a change and improve your life!' But that really isn't the message, the message is about improving everybody elses lives by getting past your own ignorance. This message is in a lot of his songs - 'Earth Song', 'History', 'Heal The World' - in fact, it's probably in nearly every song. Even going back to 'I'll Be There' by Jackson Five; a song about being there for each other, about togetherness. The themes he cares about - if we all cared about them a bit more, the world would be a better place. And I began to realise exactly what his legacy was. This is a man who, without his existence, without his creativity and his passion; there would have been a lot less dancing in the world. A lot less good times. I began to recount LOTS of memories of my childhood where his music played a central role - and I'm sure you could do the same. Whilst we can often get distracted by his controversies, underneath all that is this beautiful, moving music - this guy really cared about us. He really cared about the world. He did a lot to improve it. That's really important to me. It makes you realise the effects of your own work. I know a lot of writers who simply want to 'get hired' and get paid. They'll take a job anywhere, because they want to be working screenwriters. But I think people at least need to be aware of the effect of their work. When you write an action film with lots of violence and little meaning; this has a knock on effect on the audience, and on the world. You are responsible for what you write, for what you do. "I'd like people to remember me as someone who was good at his job and seemed to mean what he said"
There's another quote I've been trying to find, but I can't find it - or at least, who it was by. It was "It's never too early to have principles." That's so true. Some people talk about doing whatever they have to do to 'make it' and then they will write the more meaningful stuff. I find that hard to accept, it's time to build our legacies now. One of my favourite singer/songwriters is a man who has never had a record deal. We struck up a friendship after I found his music online. Sometimes he posted beautiful video versions of his songs on YouTube and they average only a hundred views. But this music is his legacy, and it's amazing - and it means more to me than so much of what counts for popular music today. 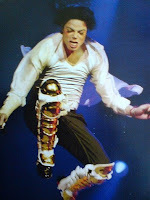 As creative people we get to do exactly what Michael Jackson did. We get to let our imagination play. We get to create. When we write a script or direct a film or act in something; we are bringing into existence things that don't even exist yet. When you think of that, it's really amazing. I only began to truly understand that quote recently. For me, relating to this industry, it's about not moaning about what films are out there, or how meaningless things are or how movie studios keep ruining films -- YOU CAN BE THAT CHANGE. You can be the exception to the rule. You can do things that are beautiful. What is your message? What do you feel? Where is nature leading you? Be the change that you want to see in the world. What is your legacy?. If you keep writing what people want to read; i.e. if you keep worrying about what the BBC want from a writer, or if you keep worrying about what is expected of a director; you will never reach your potential and you will never be happy. Some of us do what we do for money, or for fame, or to look cool; but we can do something far more powerful; we can bring amazing material into the world that will have a positive effect on peoples lives. Let's do that, let's start today. Even if you are caught up in the machine; maybe you write for the studios or you're writing a film about a serial killer, or you and your friends are making a short film with lots of blood -- but I'm sure, even in these films, you can find somewhere to put the humanity. Even if it's by writing a secondary character differently, or by putting more beautiful blue sky shots in your zombie film -- let's start thinking about who we are, and how we want to be remembered. I don't think its what we can't do that scares us, its what we can become that scares us most of all. You have realy captured the truth here about this subject, and put it so well. Thank you for writing this, it realy helps me make sense of the recent events, and the way society adapts to these situations. I can see you have the gift of writing and putting across this real mood and overall feel the world felt. Its exactly true about the memories, everyone must have of a song or a time in their life's connected to this mans music. He has left an influence and made and impact and its is a positive one I feel. You did it again: a great article !!! This is not survival of the fittest as your dumb successful average role models would want you to believe. They have lost something before they could achieve their own success and fame and they disgustedly invite you to lose it too with their usual "I have no friend" speech or "I am such an humble person deep down inside" while cluttering my TV all over the place with their poor attempt yet to be the next best thing. Thanks Michael, you were the best but the rest never give you a break ... How could they! First, thanks for dropping by my blog and commenting. And your entry here puts it all into perspective, the matter of legacy in our lives. Maybe that's it- the reason we're "renting this space"; we come into this world, and our purpose is to leave it a bit better than it was when we got there. Certain people seem to "get it", and a lot of others who don't, and some others couldn't "get it" if you stuck "it" under their noses. Writing might be your legacy...and perhaps its mine as well. Michael "got it"....and that's why we'll remember him.